Click on the image of the mug and you’ll be taken to Bas Bleu where you can purchasing one! I had the pleasure of giving the mug pictured above to a young friend for Christmas. I’m certain she has the interest and curiosity to appreciate the inspiration and fun of the first lines of novels printed on it. 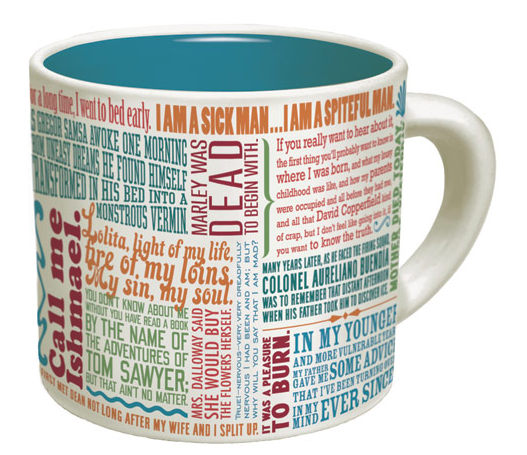 As I wrapped this gift, I was glad to find the source of each quote identified on the bottom of the mug, since I didn’t recognize them all. I got bogged down in the study of reading the quotes, which slowed the pace of my Christmas wrapping! This week, coincidentally, a fellow blogger here at WordPress posted about famous first lines of novels. Cristian Mahia has sparked lively participation, with readers sharing their favorite first lines of many books in the comments that follow his post. If interested, have a look at Cristian’s post and join in the fun by sharing your most memorable first lines of your favorite writers in the comments on his page!